The guns are loaded, the chips are on the table: Just three nights remain until we find out, once and for all, how Breaking Bad will end. Surely there's room for just one… more… theory. You guys have already listed some great theories about how you think the show will end. This new one, from Andi Teran at Previously.TV, might take the cake. Teran bases her entire theory (which she allows is "crackpot") on the name of the series finale, "Felina." 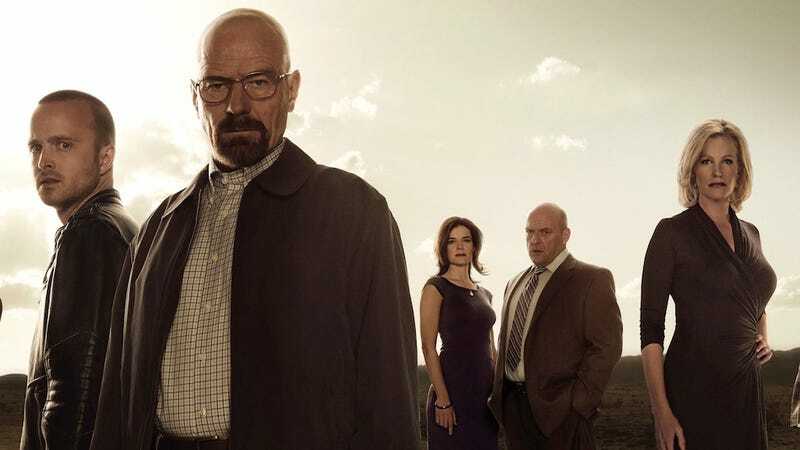 Breaking Bad veterans know that the show's episode titles have historically had a great deal of symbolic significance to the events of the show itself, so it's not that much of a stretch to make a guess about the the title means and go from there. The full lyrics can be found here, but the gist of Teran's theory (which you should really read in full) is that Walt is the narrator of the song, swept up by his love for "Felina," a dark-eyed woman. Felina, of course, is a symbolic stand-in for Heisenberg and for Walt's ambition, and eventually leads to his ruin. The song's protagonist kills people for Felina; he sacrifices everything. Teran finds lots of parallels with Breaking Bad, some of which feel like a stretch—Big Head Todd and the Nazis manage to make an appearance—and others of which line up with the way the show has teased ideas out of its episode titles in the past. At the end of the song, the song's protagonist (Walt, remember) flees dying, clutching at his side. Until… at the end… Felina appears to him in the desert and leads him into death. Who is the "Felina" in the series finale? Is she related to the Felina of "El Paso"? Is she a whirling feline dervish with a wicked glint in her eye? Is she both the ruin and the savior of our wayward cowboy? This is a totally crackpot theory, but what if "Felina" is Marie (Betsy Brandt)? In Sunday's episode, Marie stares out the window of a police vehicle. She's in protective custody, being driven home in the wake of Hank's death, only she doesn't get to go home and is whisked away when her escorts discover that her house has been broken into. If anyone on Breaking Bad has truly lost everything as a result of Walter White's choices, it's Marie. She's lost her husband, her sister, and now her home. She is alone, swathed in black, and no longer comforted by the warm violets of her environs. Interestingly, in desert gemology, the color purple signifies purpose. And if anyone deserves a shot at Walt — possibly more than Skyler and Jesse — it's Marie, the only utterly blameless victim in this whole mess. Also, not that I have that much time on my hands, but what is Marie's maiden name? LAMBERT. Will she be the Felina kiss of death? I don't know about you, but I love that. Marie! Marie takes down Heisenberg! It's perfect. And, yeah, it may just be another crackpot theory, but hey, who knows? Three nights, and it'll all be over. Any final predictions for what's gonna happen in the finale? Any last guesses? Sound off below.